Bangistan is just another attempt of making the audiences realize how religion is misread, and misinterpreted. Starring Ritesh Deshmukh, Pulkit Samrat and Jacqueline Fernandez in the main roles, the movie attempts to pass on the message of how religious fanatics use the faith of common people as a tool to spread hatred and breed conflict in society. Sadly, reviewer turned director Karan Anshuman fails to exploit the full potential of this interesting concept in this comedy flick that was released in theatres on 7th Aug 2015. The story is based on the conflict between Hindus, who live in the Southern part of a fictional country named Bangistan and the Muslims, who live in its Northern region. Caught up in this web of hatred are two misguided youngsters, Hafeez Bin Ali (Riteish Deshmukh) and Praveen Chaturvedi (Pulkit Samrat), who are convinced by their respective religious leaders to go on a suicidal mission to Poland. The two travel to Poland under disguise, with Hafeez pretending to be a Hindu and Parveen pretending to be a Muslim. They end up staying in the same hotel and soon become friends and even flirt with the hot waitress (Jacqueline Fernandiz), until their true identities are revealed. The ensuing confusion reached its peak in the extremely chaotic climax. 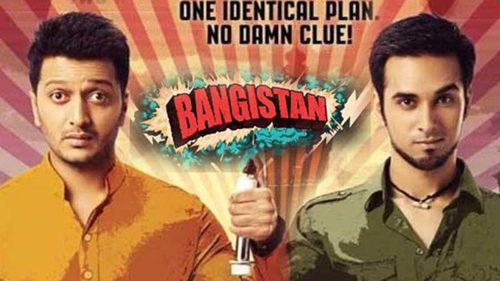 Bangistan fails to do justice to the smart script and the good intention that form the crux of this movie. Although, Ritesh Deshmukh has performed really well, his character along with most other characters in the movie are written in an extremely poor manner. Director Karan Anshuman, who has been critical of several films in his previous role of a movie reviewer, has failed to learn any lessons on about direction and ends up delivering a dud flick. Overall, the movie is may be worth watching only for its brilliant script and Ritesh’s performance and IndiaCafe24 gives Bangistan a rating of 2 stars.